Few films evoke the kind of pure nostalgia for the '80s that the Ghostbusters movies still do. For those who grew up watching the specter and slime-filled series, there was nothing quite like turning a super soaker backpack set into a pretend proton pack while coasting around in faux ectomobile Power Wheels. Even now, it's still important for any fan worth their energy stream to have enough friends around to suit up in some tan jumpers on Halloween. Before Ghostbusters became such a beloved film series, though, it existed in the very wild imagination of Saturday Night Live star Dan Aykroyd, whose original concept for the story was somehow even more outlandish. The paranormal comedy franchise has since taken on a life of its own with two original installments, at least one unproduced third script, a modern gender-bent reboot, and yet another unrealized sequel to speak of so far. A lot has happened since Aykroyd envisioned the original, from casting decisions to a sequel slump and one long road to revival. Here's what you might not know about Ghostbusters. For Dan Aykroyd, show business wasn't an inherited career path, but exploring the paranormal was. He grew up in Ontario, where his family regularly practiced seances at their farmhouse and studied spirits. His dad even wrote a book on the history of ghosts. Thanks to that background, Aykroyd really does believe in things that go bump in the night. As he quipped to Vanity Fair, "It's the family business, for God's sake." Aykroyd has copped to experiencing a number of creepy incidents himself, including seeing old friends apparate into view and summoning the spirits of his home's late former occupant just for kicks. He doesn't hesitate to admit his full belief that spirits are everywhere and pop into our dimension to visit on a regular basis, and he even buys into his mom's story about some dead relatives welcoming him when he was an infant. It was that lifelong exposure to the supernatural that first informed his idea for Ghostbusters. "I read an article on quantum physics and parapsychology in the ASPR and said, 'Why not marry the actual scientific discipline of psychic research to an old-style comedy?" he recalled to The Daily Beast. As luck would have it, Harold Ramis knew a lot about ancient cultures and beliefs and helped him couple his spiritual knowledge with some key anthropological details, and together with eventual director Ivan Reitman, they tapped out the first script. 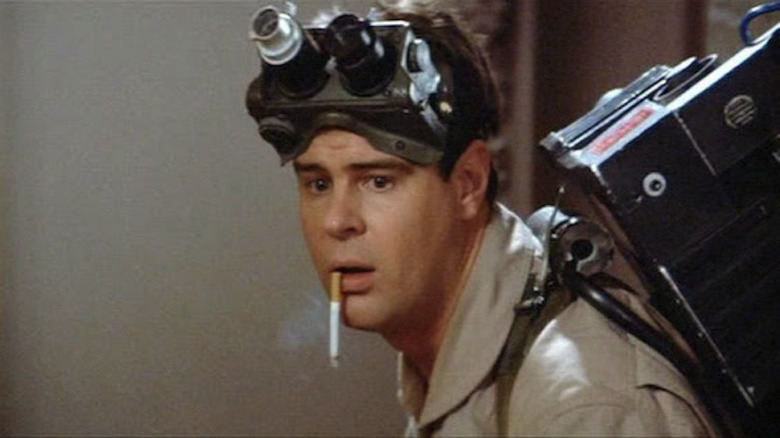 Between the "gatekeeper" demon Zuul and the Stay-Puft Marshmallow Man, it may be hard to picture the Ghostbusters story being any more bizarrely creative than the one audiences saw on the big screen, but if Aykroyd's original concept had come through, the movie would have been even weirder. The first round of scripting took those energy streams through several other times and dimensions as the heroes battled with the big bad Gozer, and the film would've been called Ghost Smashers instead. Aykroyd later admitted that the draft wouldn't have been as much of a crowd pleaser, as it included a lot of technical terms and didn't strike the same tone. "My first draft was written in a way that your basic acceleration physicist might have enjoyed more than the mass audience," he explained. "Also, my original story was more eerie in tone, and it started right off with the crew busting ghosts. The first frame was the garage door opening up at the firehall, the Ectomobile roaring out into the night and the guys going on a bust." Aykroyd showed the script to SNL co-star Bill Murray and then Murray's Stripes director Ivan Reitman, who brought in Harold Ramis to help retool the script during a getaway at Martha's Vineyard. There, they relocated the story to New York, tinkered with the characters, and got rid of the time-hopping stuff, and what resulted was Ghostbusters. Aykroyd's close personal and working relationship with John Belushi was a major part of what inspired Ghostbusters in the first place. The actor imagined the story as one which would feature the two together again, as Dr. Raymond Stantz and Dr. Peter Venkman, as a follow-up to their smash 1981 hit The Blues Brothers. After Belushi's untimely death from a drug overdose in 1982, however, that role was then offered to Bill Murray, and Belushi's influence on the film carried on in a very different way. As Reitman would later explain, "Belushi's death was the soul of the film for Danny. [...] I went in knowing that what was important was that the audience had to care about these guys, they had to want to be friends with them and to care about their friendship." As a bit of tribute to the fallen actor, Aykroyd and Ramis decided to create the character Slimer in his visage. They tasked special effects creator Steve Johnson with making the wacky spirit look like Belushi, and Johnson said that after a night of illicit substance use, he received a personal visit from Belushi's spirit that helped guide him in the right direction. 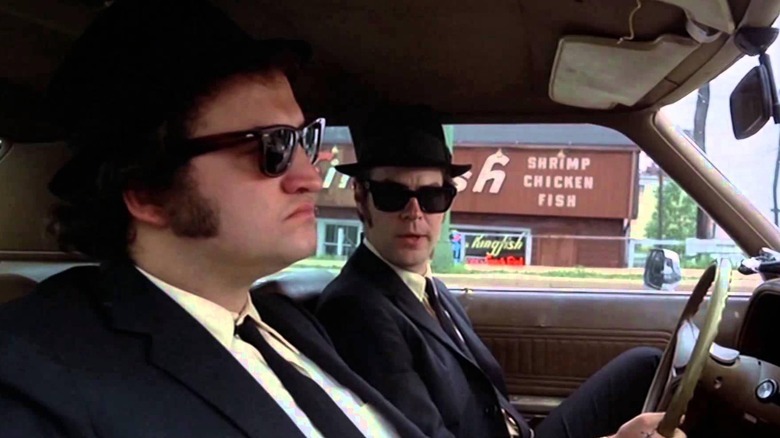 "I literally thought that John Belushi's ghost came to me to help me out," he remembered. "And that, kids, is what appears in the film." Belushi wasn't the only comedy legend whose role went to someone else in the end. The original storyboards for Ghostbusters featured John Candy, whom Reitman and Ramis had worked with on Stripes, in the role of Louis Tully. However, Candy declined the opportunity. "John Candy was supposed to be the neighbor down the hall, but he didn't like the treatment that I had sent. He didn't get it," Reitman told Entertainment Weekly. "He basically passed, and I called up Rick Moranis who I knew in Toronto, and said, "Look, Rick, why don't you take a look at this. I think it's going to be good." He read it in like one hour, called me up, and said, 'Wow, please thank Candy for me. This is the greatest thing I ever read.'" 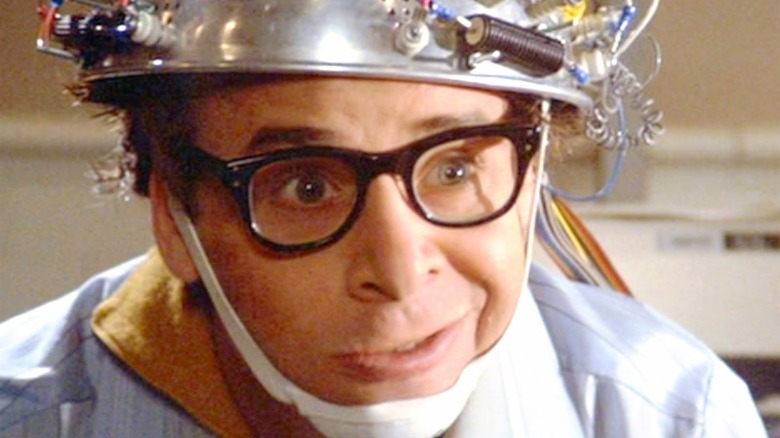 Moranis' involvement would later help shape the character, as he added his own finishing touches to the role, including his nervous party scene antics and his general air of helpless nerdiness. "Rick immediately said, "Well, I got this thing about a nerd," which is not how the original character was written. So Rick really created the character," casting director Karen Rea later remembered. If not for Candy's decision to pass, the character might not have been the earnest little dweeb that fans came to know and love in the film. 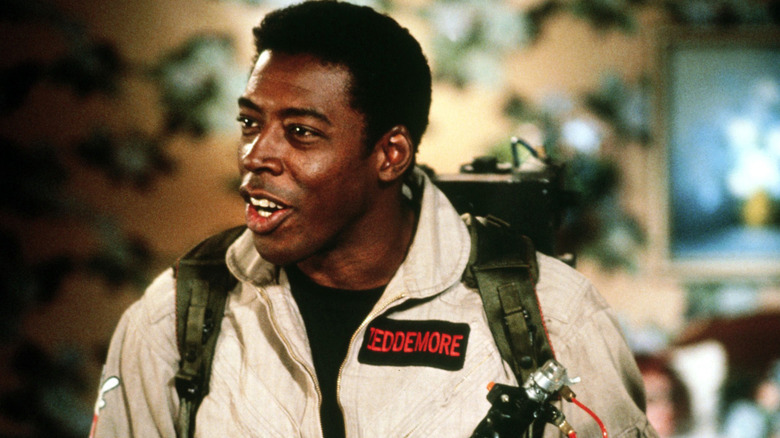 In addition to Stantz, Venkman, and Ramis' Dr. Egon Spengler, the fourth ghostbuster to suit up with a proton pack was Ernie Hudson's Winston Zeddmore. According to the actor, he expected to get a lot more screentime. Hudson has revealed that when he originally read for the role, the script included a lot more of his character than what was written in the shooting screenplay. "Winston is in the film all the way through the movie. But they changed it just before we shot, so I had to wrap my head around that," he told The Guardian. Hudson later wrote in an essay for Entertainment Weekly explaining that he believes the character was originally written with fellow SNL ace Eddie Murphy in mind and that he only found out about the diminution of the role the night before filming began. "I get this new script and it was shocking. The character was gone. Instead of coming in at the very beginning of the movie, like page 8, the character came in on page 68 after the Ghostbusters were established. His elaborate background was all gone," wrote Hudson. The film has since been accused of pigeonholing him as a "token black guy," since his background was so greatly reduced, and the three white leads were all well-developed scientists. "Then when we came back five years later for the sequel, they did the same thing! That I didn't understand," Hudson said. 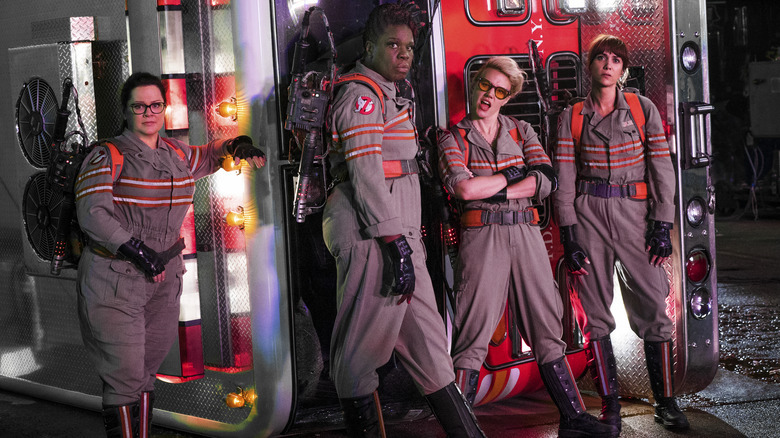 Ghostbusters' $30 million production budget might have seemed risky for Columbia Pictures, given the film's untested concept, but it paid off big time. The movie went on to make over $200 million at the box office, becoming the second-biggest film of the year and earning respect from critics, who lavished near-universal praise on Murray's performance and the film's originality and good humor. The movie was also marketing gold for kids' toys, so it's no surprise the studio was all in for a second act right away. However, their enthusiasm became somewhat problematic. 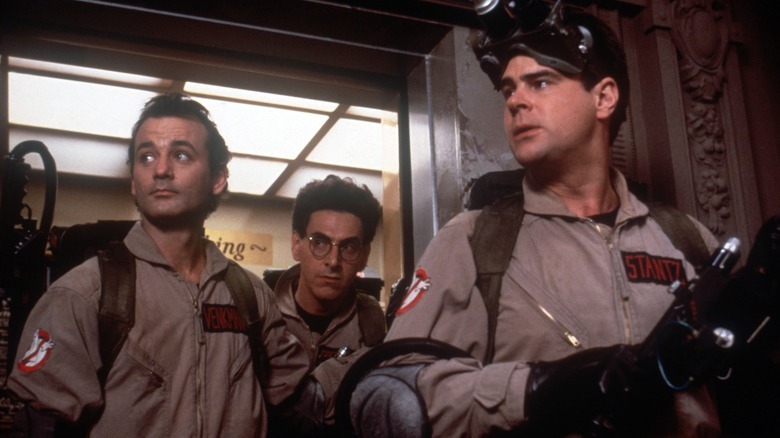 In 1987, the public even caught wind of some friction between the brass and the film's creators, as Columbia's execs announced a production start date for Ghostbusters II before Aykroyd and Ramis had the script ready for Reitman's review. Ramis even revealed some hesitation about circling back to the story, telling The New York Times, "we were afraid to touch it, it was so big." Once the script was ready, they also had to convince Murray, who was famously sequel-resistant, to come on board. He ultimately did so, he admitted, because "working on the first Ghostbusters was the most fun any of us had." 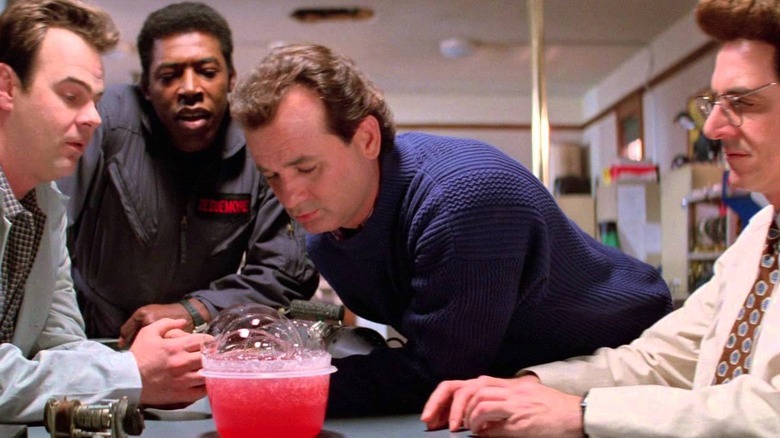 Reitman said they resisted the temptation to overdo it with the slime-slinging formula of the first film and focused instead on character interactions between the titular ghostbusters; however, audiences were much less thrilled by Ghostbusters II, as proven by the film's slackened ticket sales and grim reviews. 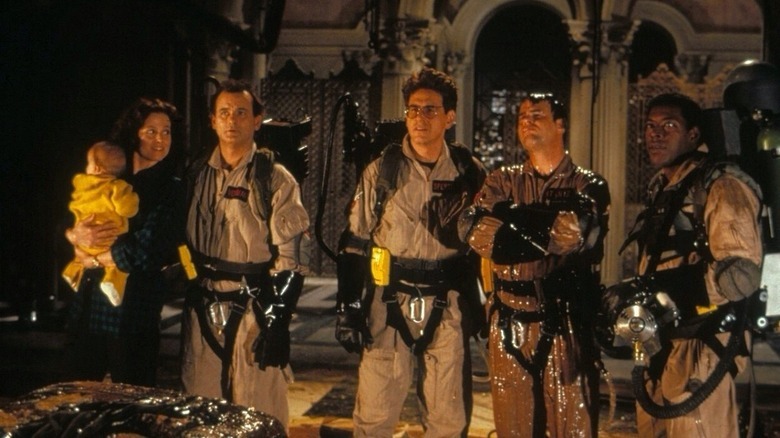 Despite the fact that Ghostbusters II was a shadow of the original, Aykroyd still wasn't done tapping out new scripts for the series, and if his vision for Ghostbusters 3 had ever come to cinematic fruition, fans might have finally gotten a glimpse of the interdimensional story he pictured in the first place. Aykroyd wrote the script for Ghostbusters 3: Hellbent in 1999, and some film sites got a glimpse of the pages a few years later. As Aykroyd would later describe the script, it would have sent the ghostbusters to a place called "ManHELLton" where they meet a big bad named Lou Siffler (a homonym for Lucifer) who appears to be like a "Donald Trump-like character" resemblant of the devil, living among the wealthy demons occupying Central Park's neighboring high rises. Bill Murray wanted absolutely nothing to do with it, later telling Variety that he found the script to be "crazy bizarre" and "kind of funny, but not well executed." 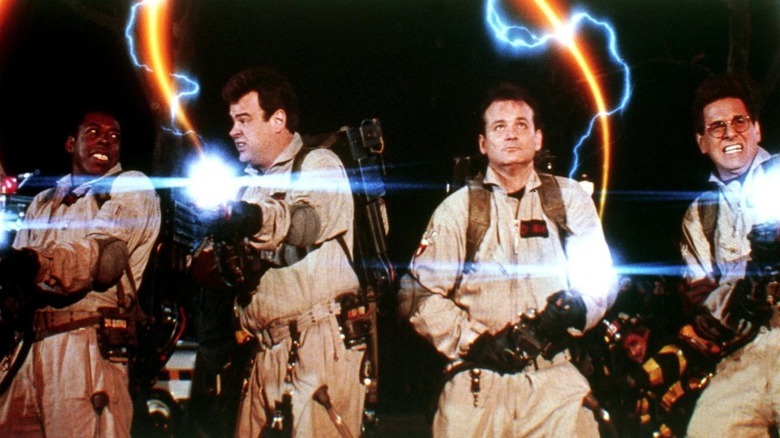 However, the rest of the ghostbusting gang refused to give up. Lee Eisenberg and Gene Stupnitsky were hired to write a new script alongside Aykroyd and Ramis, and then Etan Cohen was engaged to try again, producing a script which would account for Murray's absence. It wasn't until Ramis' death in 2014 that the project finally, fully bit the dust and Reitman decided to walk away from the director's chair. 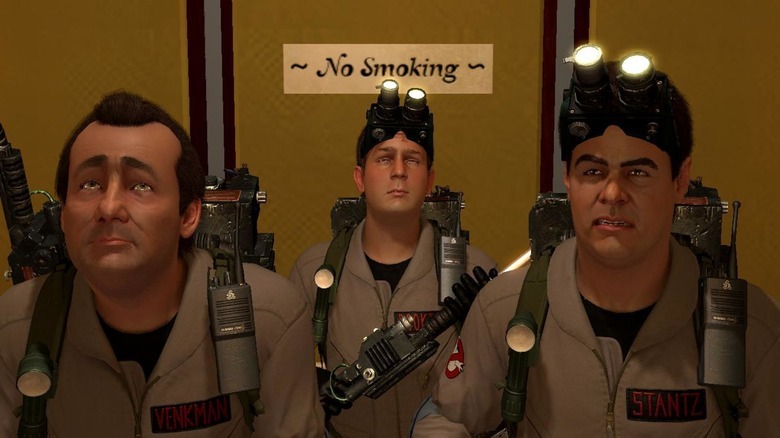 Although Ghostbusters 3 never came to be as Aykroyd originally intended it, his idea for the story did get a short second life in the form of 2009's Ghostbusters: The Video Game. By then, the chances of Hellbent ever happening had become very slim, so Aykroyd and Ramis teamed up to create a playable version of the story that included a merging of the real world with his fictional ghost realm. Set two years after the events of Ghostbusters II, the game follows a rookie trying to join the ghostbusting team and ultimately being thrust into an epic Ghost World battle against the satanic architect who created a building to summon demons to the streets of New York. Aykroyd said he ultimately regarded the game as "essentially the third movie" and added that he believed "it's better than the third movie because it lasts longer and there's more development of the characters. [...] I tell people this: 'If you have an appetite for the third movie, then the videogame is it.'" Although Murray was reluctant to sign up for the third film, he happily participated in voicing the video game version of Venkman. However, this time, the major holdout was Rick Moranis, who took an extended hiatus from Hollywood after the death of his wife. Meanwhile, Sigourney Weaver waited a little too long to say yes, and her character Dana Barrett was not included in the game as a result. Although Reitman decided against directing a third Ghostbusters movie, he did retain a great deal of creative control over what happened next. He took on the role of executive producer and began to conceptualize the project as a remake instead of a sequel. Once Paul Feig came on to spearhead the project, Reitman considered himself a sort of creative supervisor. His deal, which included the establishment of his production company Ghost Corps with Sony Pictures, opened the door to the all-female reboot which ultimately arrived in 2016, along with a television series called Ecto Force, which would be set in 2050 and feature ghostbusters from around the globe, and more video game properties. Murray was again hesitant to participate in the new film but decided to do so because of how much he approved of the female cast, including SNL favorites Melissa McCarthy, Kate McKinnon, Kristen Wiig and Leslie Jones. "I really respect those girls. And then I started to feel like if I didn't do this movie, maybe somebody would write a bad review or something, thinking there was some sort of disapproval [on my part]," he told Vulture of his decision to do a cameo. Despite the good faith effort, however, the film was beleaguered by sexist backlash and, though greeted with respectable reviews, failed to command an audience quite like its forebears. Although Sony's deal with Reitman indicated some serious studio ambition about the future of the Ghostbusters franchise, 2016's Ghostbusters reboot was a bit of a letdown for everyone involved. Aykroyd even publicly placed the blame for the film's disappointing box office returns on Feig's failures to economize the budget and take instructions from the original creatives (although he did like the film and its cast). However, Reitman still hopes that a sequel to the film might materialize, and Feig has indicated his commitment to making another movie happen as well. 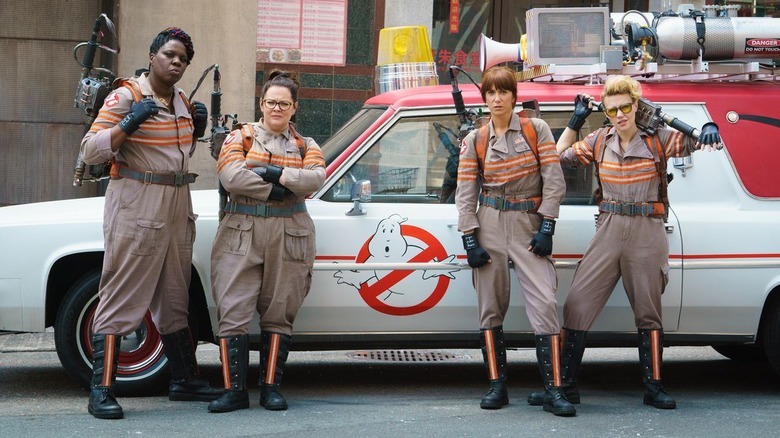 In fact, Feig has shared a preview of what his Ghostbusters 2 might look like, saying that he wanted to see the ladies take their trade abroad for the next film. "I definitely wanted us to go to another country. Because when we were doing the press tour, the international press tour, every country the reporters would come with these drawings or artist renderings of that country's ghosts," he explained during a 2018 Happy Sad Confused podcast (via MovieWeb). "Every country has these really wild ghost stories and ghost characters that they scare kids with or keep people in line with. I really loved the idea of the Ghostbusters going to like Asia. Yeah, so there's a lot of fun stuff what we could have done." Considering it took almost three decades for the third film to happen, fans might not want to hold their breath… unless they want to end up like Slimer.